Classic queen poster bed gets a soft, romantic update with a shaped headboard, upholstered panels and distressed linen finish. Classic king poster bed gets a soft, romantic update with a shaped headboard, upholstered panels and distressed linen finish. Stunning queen bed in a silver lacquered finish flaunts a diamond-tufted upholstered headboard and mirrored trim for extra glitz. Stunning king bed in a silver lacquered finish flaunts a diamond-tufted upholstered headboard and mirrored trim for extra glitz. Light linen upholstery and hand-applied nail head trim add a soft touch to the elegant curves and antique cherry finish of this mansion bed. Ornate detailing on the headboard, chic upholstery and an antique gray finish give this full-size bed an air of everyday opulence. 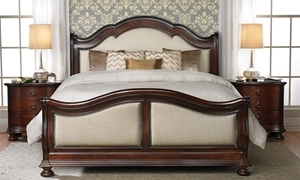 Queen sleigh bed in a rich coffee finish features a tall headboard upholstered in hand-tufted neutral fabric and trimmed in nail heads. 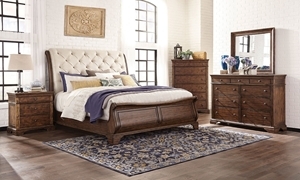 Tufted leather queen sleigh bed in rich mahogany finish features ornately carved walnut inlays and antique nail head trim details. 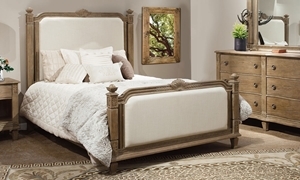 From classically inspired headboards with tufting and nail head trim, to sleek cushioning with a simple silhouette, Haynes has the perfect Upholstered Bed for every style.